Umber Paint - High quality acrylic paints - Easy to use and mix. Thin paint and clean brushes w..
Khaki Paint - High quality acrylic paints - Easy to use and mix. Thin paint and clean brushes w..
Golden Brown Paint - High quality acrylic paints - Easy to use and mix. Thin paint and clean br..
Rust Paint - High quality acrylic paints - Easy to use and mix. Thin paint and clean brushes wi..
Stone Green Paint - High quality acrylic paints - Easy to use and mix. Thin paint and clean bru..
Old Gold Paint - High quality acrylic paints - Easy to use and mix. Thin paint and clean brushe.. Bright Old Gold Paint - High quality acrylic paints - Easy to use and mix. Thin paint and clean..
Silver Paint - High quality acrylic paints - Easy to use and mix. Thin paint and clean brushes .. Bronze Paint - High quality acrylic paints - Easy to use and mix. Thin paint and clean brushes ..
Blue Steel Paint - High quality acrylic paints - Easy to use and mix. Thin paint and clean brus..
Copper Paint - High quality acrylic paints - Easy to use and mix. 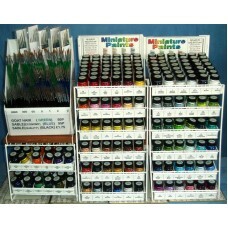 Thin paint and clean brushes ..
Chainmail Paint - High quality acrylic paints - Easy to use and mix. Thin paint and clean brush..
Basetex Colour Paint Brown 100ml ..
Basetex Colour Paint Dried Earth 100ml ..
Basetex Colour Paint Green 100ml jar ..